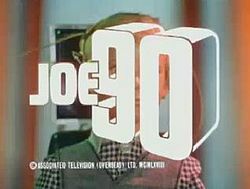 Each evening Dad, Gemma-Rose and I settle down on the sofa to watch one of our favourite TV series, Joe 90. Joe is a very funny nine year old boy who goes on all these exciting adventures to save the day. He is always going off and flying planes, rescuing people in space and so many other things. Whenever people ask what Joe is doing, all he has to do is to say the truth to get out of trouble, for who would believe that a nine year old boy was finding a bomb? Once Joe had to help a famous pianist to get out of trouble. To do so, he had to play the piano instead of the pianist. No one thought it would work, but it did. Joe's father does not always like Joe going out and saving the day, but whenever he says no, Joe always ends up helping out anyway. Joe is a really good main character, not like some you can find. I love Joe 90.